Several years after Season 3 (and time-jumping to after Season 8 of The Walking Dead), Morgan Jones (Lennie James) leaves the town of Alexandria to go on a journey of moral self-discovery. What he finds are the surviving leads from Fear the Walking Dead, now scavenging and living as bandits. Desperate to survive, Morgan befriends a cowboy named John Dorie (Garret Dillahunt) and a SWAT truck-driving documentarian named Althea (Maggie Grace). But as survival becomes more challenging in Morgan’s new and unfamiliar environment, both sides will have to join forces in the ongoing struggle to building a new home. It really says something about a show when the few characters introduced in the newest season are infinitely more likable than the main cast ever was. My favorite new character is easily John Dorie, who seems like a simple-minded redneck, but he has such a good heart that I felt myself wishing Morgan and John had their own spinoff series. Morgan’s, John’s, and Althea’s dynamic is surprisingly strong too, forming an engaging survivalist bond as they travel from place to place. Unfortunately, at least in the first half of the season, their journey is hampered by the confusing timeline jumps between them and the original cast. Morgan’s, John’s, and “Al’s” stories are in the “NOW” portion of the timeline, whereas back in the “THEN” timeline, Madison (Kim Dickens) and her kids Nick (Frank Dillane) and Alicia (Alycia Debnam-Carey) have fortified a baseball stadium (not to mention completely abandoned the storyline begun at the end of Season 3). And just when things are feeling a little too safe, an arrogant man named Mel (Kevin Zegers) and his gang knock on their door, demanding half of all of their supplies “or else”. Predictably, Madison says no; something we’ve already seen on the real Walking Dead show with Negan and Rick Grimes. As if creativity wasn’t limited enough, Mel turns out to be a two-bit Negan clone with zero personality and even less menace. What follows is a convoluted series of time jumps juxtaposing the causes of “THEN” with the effects of “NOW” but without a coherent or progressive storyline; just a chain of coincidences and betrayals sloppily stitched together leading to one of the slowest (literally in slow-motion!) and most melodramatic mid-season finales in TV history. 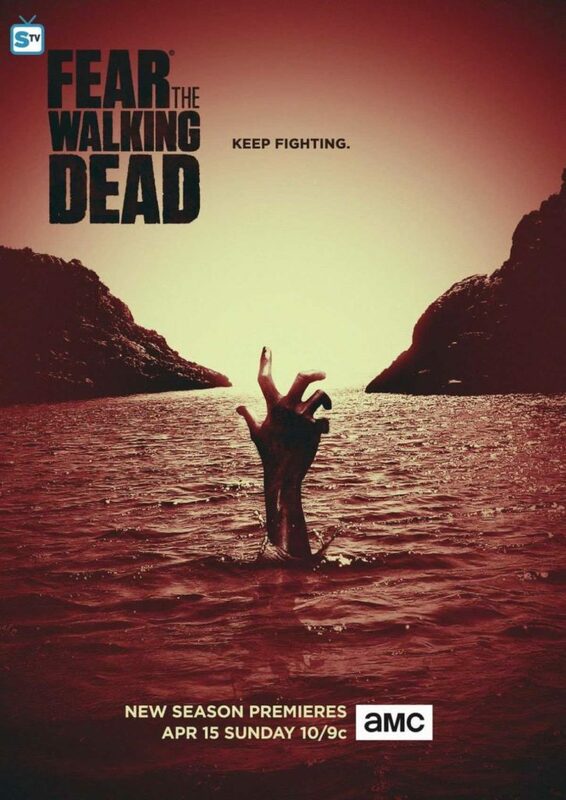 But don’t worry, because the meandering second half of the season has flying zombies. Seriously. A powerful (too powerful) rainstorm begins devastating the region while somehow catapulting the dead into the air. (And it looks as stupid as it sounds.) This means our “heroes” are separated from one another and forced to find new ways of surviving. Thankfully, the original cast takes a backseat, and the far superior new characters (particularly Morgan) rise up to carry the series forward. It’s not all sunshine and rainbows, though. The returning characters – Madison, Nick, Alicia, Strand (Colman Domingo), and Luciana (Danay Garcia) – are just as annoying and useless as ever, maybe even more so. Jim (Aaron Stanford), one of the new characters, makes beer, likes beer, and has devoted his entire life to beer (#WeGetIt). Naomi (Jenna Elfman), another new character, is interesting when she’s secretive and running from something, but duller than a box of rocks after she opens up about it. Althea’s obsessive video interviews and motherly protection of her precious interview tapes borders on tongue-in-cheek. And Crazy Martha (Tonya Pinkins), this season’s belated main villain, whose anti-help ideology drives her to make people strong by trying to kill them every chance she gets, comes off as more of a one-note nuisance, with no sense of danger whatsoever whenever she shows up. Fear the Walking Dead has previously taken place years earlier in the timeline than The Walking Dead. But now all of a sudden they’ve lined up both shows chronologically. It’s a guarded strategy, as if the showrunners are admitting their original idea for Fear wasn’t strong enough on its own. It’s also a giant red flag that the end may be near for this mediocre-at-best spin-off. But the final few episodes put Morgan front-and-center, the only character besides Rick Grimes to have lasted since the very first episode. This season is his story, and by association, his TV show now, demonstrated by his taking command in this season’s final episode. This show may still be pockmarked with flaws in each and every episode, and the talentless writing is more bitter than ever, but like bad food that’s now gone cold, it’s somewhat easier to forget that it was never good in the first place.